Q: Has Orion's progress so far lived up to your expectations? A: As far as the level of the work I've done on the title, yes. Naturally, I wish we had sold more copies. But I'm pleased with several of the issues in particular (10, 11 and 15 spring to mind) and with the series in general. I only wish the book had run longer as I probably have another 2 or 3 years worth of stories in the drawer. Q: Had Orion continued on past #25, what kinds of adventures would have taken Orion and the Fourth World into? A: I don't want to give away too much in the way of plotlines even for stories I haven't done yet; you never know what opportunities you'll have to use them in the future. But generally speaking, I would have taken Orion into more adventures on Earth itself, and also into some cosmic adventures that would have carried him off into other parts of our universe. I also had an idea to return to the dog, Sirius, have Orion free him, and then explore the nature of the relationship between the New Gods and the Old Gods. Q: What kind of input did you have on Our Worlds at War? And what are your thoughts about how the New Gods (specifically Darkseid and the Black Racer) were handled in that event? A: My input consisted mainly of my adjusting my own storylines to allow the Superman writers to use Darkseid a little in advance of when I would have brought him back in ORION. But I had plans to bring him back anyway so I wasn't making major changes. And I think worked out well for me in the long run. I was able to tighten up some of my own plots. The idea of bringing Apokolips to Earth was an idea out of the Superman office and that fit into my own story pretty well. As far as the actual use of the characters in the cross-over, I'm going to shamefacedly admit that I didn't read any of them since Orion himself was off and away in a distant corner of the DCU by the time the cross-over happened so I didn't have to follow it for reasons of continuity. Consequently, as you can imagine, I've no comments to make on how Darkseid or the Black Racer were handled. Q: If DC approached you to do another New Gods project, would you focus more on Orion or on other New Gods? Mr. Miracle? Dr. Bedlam? Gedirath and Justeen (one can only dream...)? A: Orion is really my favorite of the New Gods characters. I think he's the most complex and offers the greatest possibilities for exploration. But I think it would be fun to go find out what Justeen is up to now. A: Mostly irregular hours, scattered here and there as long as the deadline is distant. The closer the deadline gets, the more concentrated my days become and once the deadline is nearly upon me, I'm flying through pages. And thanks to my wife, Louise, I eat just fine, something that was not true back in my bachelor days. I generally write a plot first, then thumbnail the entire issue. I script the story from my thumbnails and then trace them off loosely onto full size drawing boards (paper). The script is lettered on the boards and when I get them back, I tighten up the pencils and then ink the job. I generally keep the pencils loose until after the lettering is done because that way, I can make any adjustments to the drawing that I want so the words and pictures will fit together precisely. Q: Have you ever been tempted to write for any medium other than comics? TV? Movies? A: Not really. Louise and I did a movie treatment once years ago for a possible Fantastic Four movie and I've done a little drawing for TV and movie projects but mainly, I like doing comics. Q: If you WERE given creative control of any TV show or movie, which would it be? A: Beats me. I'd settle for pristine copies of the Prisoner and a really big wall sized television with surround sound. I'm a cheap date. 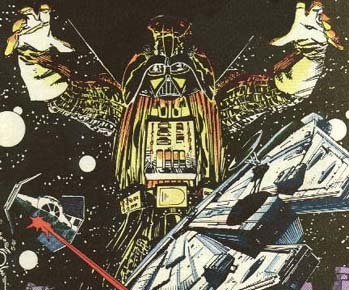 Q: Your Darkseid vs. your Darth Vader: who'd win? :)....how did that get in here? SEAN?? A: There isn't any character I'd rather being doing than Orion. There are some other ones that would be fun. A magical character such as Dr. Fate or Dr. Strange would be challenging. And I've always got the Star Slammers in the back of my mind somewhere, as well as a couple of new projects of my own that would be fun to realize eventually. Q: Why didn't you ever draw/write a Hulk/Thor fight? A: I never had any reason to. When I was doing Thor, I don't think it ever occurred to me to try to guest star the Hulk; he really had nothing to do with the stories I was telling. And when I wrote the Heroes Reborn Avengers, they'd already done one in that title. I don't generally start on story ideas by thinking--wouldn't it be cool if these two folks met? I'm not saying I haven't done that somewhere but it isn't the way I usually approach writing stories. Mostly, I try to find a starting point for a character and then let the stories develop organically. So I don't think the idea of doing a Thor/Hulk fight would be something that would likely occur to me in the course of plotting stories. I mean, I did read the Thor/Hulk fight back when Stan and Jack did it for what I presume was the first time in JIM 112 or thereabouts. Maybe because of that, I never felt the urge to revisit the idea. Q: You created quite a few characters for the trading card series known as "Creator's Universe". Are there any plans to use any of these characters in the future? A: I think for the 'Creator's Universe', I did two cards, Rojas and Phaedra, both of them characters from the Malibu/Dark Horse Star Slammers series. But I do have other Slammer stories worked up and I do hope to get the chance to work on them one of these days. Q: You drew Lois and Clark in an issue of Thor years back. What made you decide to do this? A: It was just fun. Back then, you could do stuff like that and it was enjoyable partly because there wasn't much to it. It was fun, people got the joke, end of story. Now, that sort of thing gets listed in price guides and assumes a weight way out of proportion to its significance. I'm not saying I wouldn't do something like that again but it would be difficult to do with the kind of innocence that was intended then. Q: You were the artist of the X-Men/Teen Titans crossover with Marvel/DC. After all these years do you feel that you could have done something better with it if you would have done it today? A: Nope. I was proud of it then, and I thought that Chris, Terry, Glynis, Tom, Weezie, and I did a damn fine job on the book at the time. My work has changed a lot since then so whatever I would do with a project like that now, it would just be different. Which doesn't necessarily mean better. But I hope it would be as good. Q: If given the chance by both Marvel and DC, would you write/draw an Eternals/New Gods limited series? A: I would certainly think about it. If I thought I had a good idea for such a cross-over, I might very well do it. 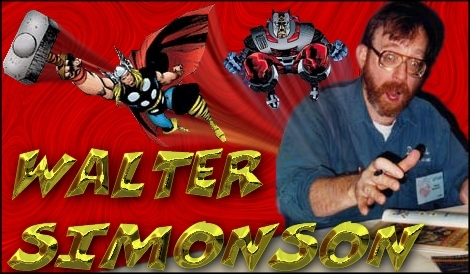 Q: If you could say one thing to any aspiring Walt Simonsons out there..what would it be? Every Poet & Musician & Artist, but for grace, is drawn away from love of the thing he tells, to love of the telling till down in deep hell, they cannot be interested in God at all but only in what they say about him. The significance of this to me is that you should never forget that the entire purpose of comics as a medium is to tell a story. It's not to razzle-dazzle 'em with your fancy footwork, wow them with your spectacular rendering, or blow them away with special effects in Photoshop. You can do all that stuff; but it should be in the service of the story. Always keep the story in mind; not the telling of it. Sean and DONAR would like to thank Walt for his time in answering our questions. ComicBoards.com: Your place to discuss comics! Alvaro's ComicBoards.com is owned and operated by Alvaro Ortiz and Dave Galanter and administrated by Josh Lothridge.